New York, NY (Restaurant News Release) Melt Shop, the pioneer of the Melted Sandwich Movement, announced today the opening of its newest corporate-owned restaurant in the Menlo Park Mall, a Simon mall located in Edison, New Jersey. The new Melt Shop marks the brand’s first restaurant in the city, and third location in the state. To celebrate, Melt Shop will be hosting a grand opening party on Saturday, April 27 from 11 a.m. to 3 p.m., where it will be giving away free sandwiches to the first 50 guests (one per customer). There will also be a DJ and raffle giveaways. Conveniently located at 55 Parsonage Road, Melt Shop in Menlo Park Mall is in the second-level dining pavilion. The restaurant features the company’s newest storefront design and kitchen package, which includes Melt Shop’s signature double-stacked conveyor oven that enhances food quality and shortens ticket wait times. Melt Shop in Menlo Park Mall will also feature the brand’s latest innovations, including Housemade Chicken Tenders and the Vegan Burger Melt, as well as online ordering and catering, which utilizes the brand’s newest fully-insulated packaging. Recently named one of Entrepreneur’s Top New Franchises and Fast Casual’s Top 100 Movers & Shakers in 2019, Melt Shop remains committed to providing its guests, franchisees and staff a product and experience unmatched in the fast casual space. 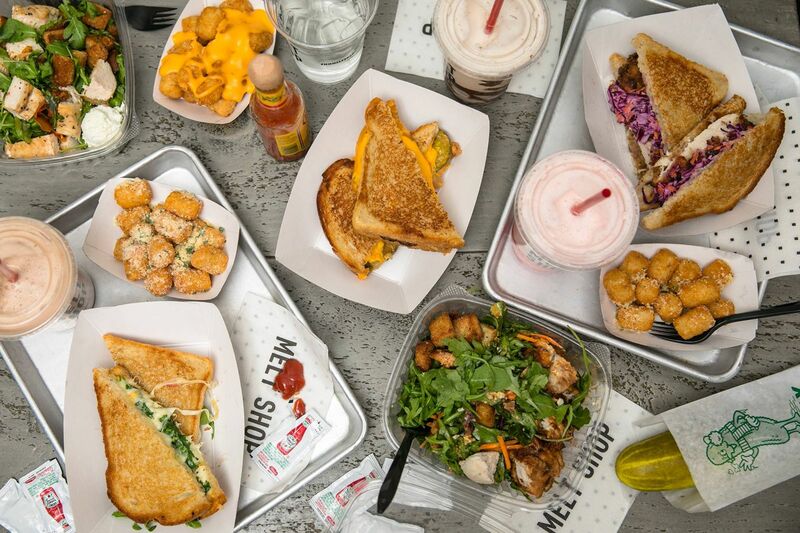 In addition to growing across New Jersey, Melt Shop opened its ninth New York City location earlier this year and just reached an agreement with Skyport Hospitality to expand into airports. The brand will debut at JFK and Pittsburgh International Airports in 2019. To further drive growth, the brand is seeking well-capitalized multi-unit franchisees in New York, the Mid-Atlantic and Midwest regions, as well as in Florida, who are entrepreneurial, have a strong knowledge of their markets, and are excited to be a part of a culinary experience unmatched in the melted sandwich space. Since launching into franchising in September 2017, Melt Shop has added more than 30 restaurants to the pipeline and remains well ahead of its goal to open 100 locations by 2023. Founded in 2011 in New York City, Melt Shop is a melted sandwich restaurant that uses only the best ingredients. As the pioneers of the melted sandwich movement, the company offers a variety of melted sandwiches, tots, tenders, salads, and shakes. Today, Melt Shop has grown to 14 locations in and around New York City, Pennsylvania, Minnesota, Delaware and New Jersey. Melt Shop has received numerous accolades including rankings in Entrepreneur magazine’s 2019 Top New Franchises and Fast Casual’s Top 100 Movers & Shakers in 2018 and 2019. Melt Shop does more than create melted sandwich masterpieces; it creates a culinary experience unmatched in the fast-casual space. For more information about Melt Shop, visit www.meltshop.com and www.meltshopfranchise.com. An expansive retail destination for discovery, fashion and community, Menlo Park Mall is located on Route 1 South and Parsonage Road in Edison, New Jersey, and is managed by Simon, headquartered in Indianapolis, Indiana. The two-level super-regional mall features Nordstrom, Macy’s, Barnes & Noble, The Cheesecake Factory, an AMC Dine-in Theater, a Disney Junior Play Zone and 175 specialty stores. Additional Simon information is available at www.simon.com. Visit www.shopmenloparkmall.com for the latest mall events and retailer updates. Menlo Park Mall is on Facebook; check out www.facebook.com/MenloParkMall. Follow the mall on Twitter: @MenloParkMall.